July was the second month for my kid's Not Your Mama's Bee. 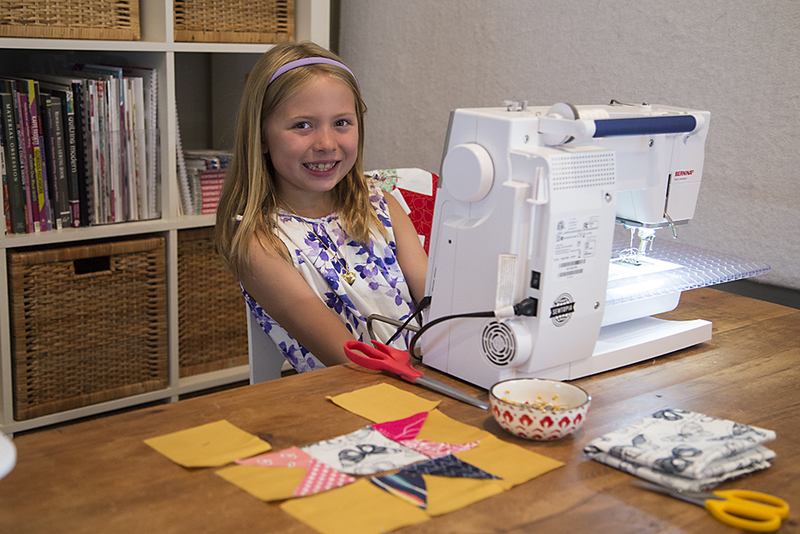 If you happened to miss June's post, a group of friends have put together a quilting bee for our kids! We have ages 5 to 9, boys and girls. And I think the parents are learning as much as the kids. This month happened to be my daughter's month to request blocks. Recently we have been talking about giving her bedroom a little makeover. I decorated it back when she was 2, and although I think it still works great for an 8 year old, she is ready for a change. I can't really argue too much with her, as I change things here and there all the time. The kids are doing great with the sewing machines. I have my daughter using my BERNINA 440QE and she can now pretty much sew independently on it. My son is sewing with my help on my BERNINA Ambassador machine (the 750QE). He loves to push the thread cutting button when we are done stitching. This month I started letting him push the foot pedal, but I still help guide his hands as he guides the fabric. To say he's accident prone would be an understatement! Much to their dismay, I am still keeping the speed turned way down on both machines. So far she's received 9 of her blocks. Above you'll see the 6 we had back when we took the photos. She is talking about doing a random layout with blocks of solids/prints mixed in. (Similar to my Starfall Quilt). And now we are already into August, and ready to sew a new block for a new friend!